One of my favorite poems is In Flanders Fields, by John McCrae and I requested to be part of the blog tour for Fall of Poppies based on the title alone. I wasn’t familiar with any of the authors, but the concept drew me in. Especially since it’s an anthology. I love anthologies. I love being introduced to new (to me) authors. I love reading a collection of stories where each one takes me on a different ride. The ups and downs. The highs and lows. Fall of Poppies is just such an anthology. Each story is heart wrenching and hopeful, in a time of loss like the world had never seen. The Great War. The war that was supposed to end all wars. When your mortality is staring you in the face, what better way to fight it than through love? Each author more than does justice to this concept. Faith. Renewal. Love. Everything we need to rebuild shattered lives. They not only invoke the time period through the images they create with their words, but also managed to invoke the time period with their words. Through the speech and eloquence of their prose. 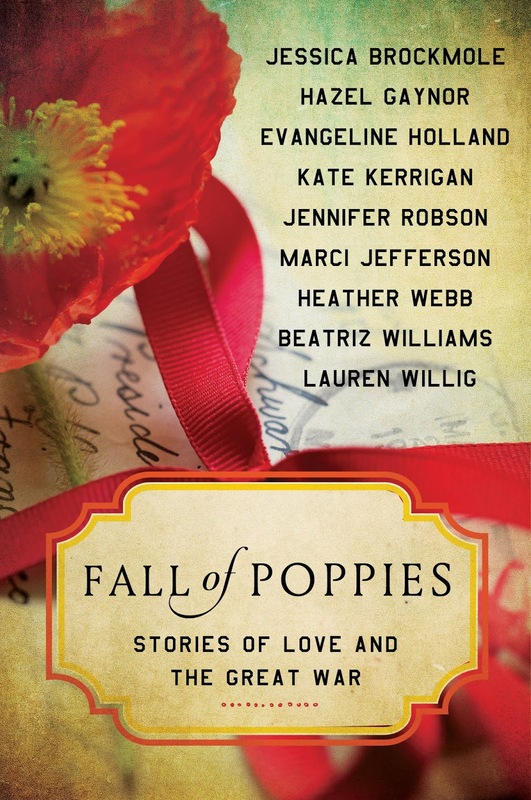 For any historical romance fan, Fall of Poppies is a must have. I first met her, crying, outside of the medical department at Romorantin. She’d been there, hunched on the bench in the hall, when I arrived for my appointment and was still there when I stepped from the doctor’s office. She wore the same bland coveralls and white armband as the other women who worked in the Assembly Building and I might have walked straight past. I always managed to make a fool of myself in front of women— on one memorable evening with an untied shoe and a bowl of chowder— and was sure today would be no different. After all, I’d just been standing stark naked in front of another man and was still a little red in the face. But she chose that exact moment to blow her nose, with such an unladylike trumpet that I couldn’t help but turn and stare. I’d never heard such an unabashed sound from a woman. She didn’t even seem to care that she sounded like an elephant. She just kept her head down and her face buried in an excessively crumpled handkerchief. She looked as healthy as a horse to be sitting outside the medical department. Not as scrawny as the other French girls around here. She had dark hair parted on the side and pinned up in waves, but her neck was flushed pink. I wondered what kind of bug she’d caught to leave her so stuffy. “Hello. Are you waiting for the doc?” I asked. The army doc wasn’t much— despite the file in his hand, he’d insisted on calling me “Weaselly” instead of the “Wesley” on my paperwork— but he could probably give her some silver salts or, at the very least, a replacement handkerchief. She lifted her head and blinked red, wet eyes. I could have smacked myself. I was a dope. She wasn’t sick. She was miserable and sobbing and I had no idea what to do. If I’d had a sister or a girlfriend or a mother with a heart made out of something softer than granite, I might have known how to handle a teary woman. I’d never gotten as far as breaking a girl’s heart. Regardless, a clean handkerchief would be a start, and I dug in my pockets until I found a slightly wrinkled one. I held it out, but between two fingers, like feeding a squirrel. She looked surprised at my offer, though I wasn’t sure why. A nice- looking girl like that, surely she was used to kindness. She stared at me, then the square of cotton, then me again, considering. I thought to add a few words of eloquence to my offer. “Go on,” I said instead. “I have dozens.” It wasn’t Shakespeare, but it must have been enough. That probably wasn’t enough. Chaplains and grandmothers always had a reassuring word or two. I wondered if I should take a cue from the padre and go with a pious Trust in Godor an old-fashioned There, there. I realized, belatedly, that I knew how to say neither in French. She saved me from having to make a decision. “I am fine, really,” she said in quite excellent English. Tears welled up fresh in her blue eyes, but she nodded, almost too vigorously. “Yes, never better.” She crushed the handkerchief to her eyes. I didn’t believe her. People who were fine didn’t cry uncontrollably in the hallway. “Bad diagnosis?” She looked healthy enough, with those pink cheeks and bright eyes, but I was no expert. Maybe she had just found out she had a week to live. This was mystifying, but I suppose that was the way of women.